Here’s an interesting story, especially for those of us who are interested in Florida history. I came across it quite accidentally while perusing an old 1919 issue of DAR Magazine, available on Internet Archive. 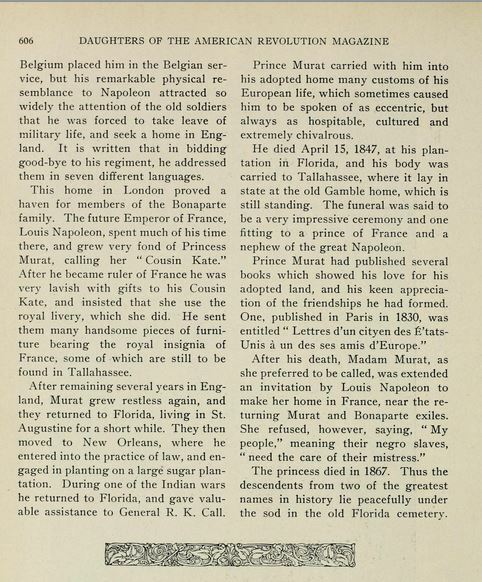 By Clara Ryder Hayden, it gives a brief account of the fascinating life and times of Prince Charles Louis Napoleon Achille Murat (1801-1847), son of Joachim Murat, King of Naples, and Caroline Bonaparte—sister of Napoleon Bonaparte. 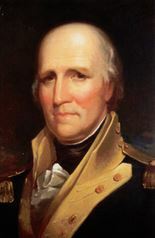 Charles became an exile after the Napoleonic Wars and his father’s execution, and circumstances sent him on a trail of moves starting in Austria and ending in Florida in 1824, several years after Florida was acquired from Spain. 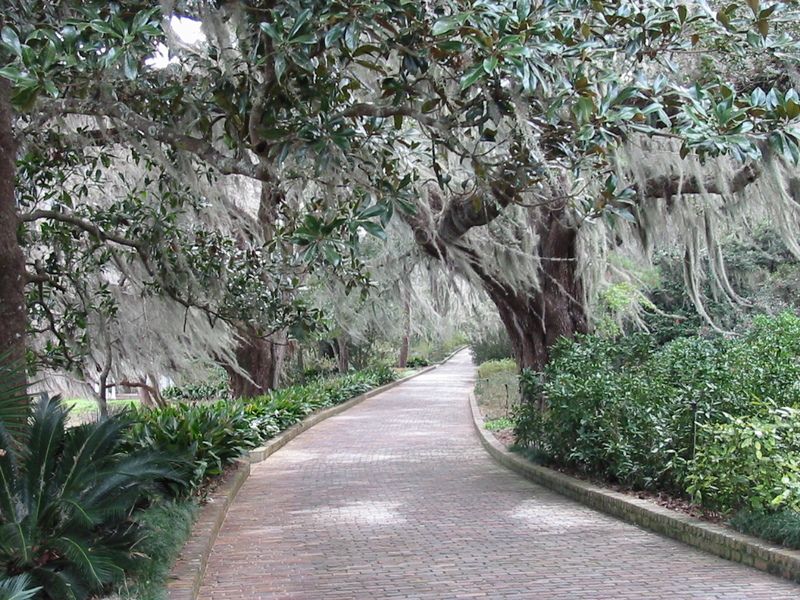 Initially Charles settled outside the city of St. Augustine where he purchased twelve hundred acres of land and was known by the locals for his rather eccentric behavior. 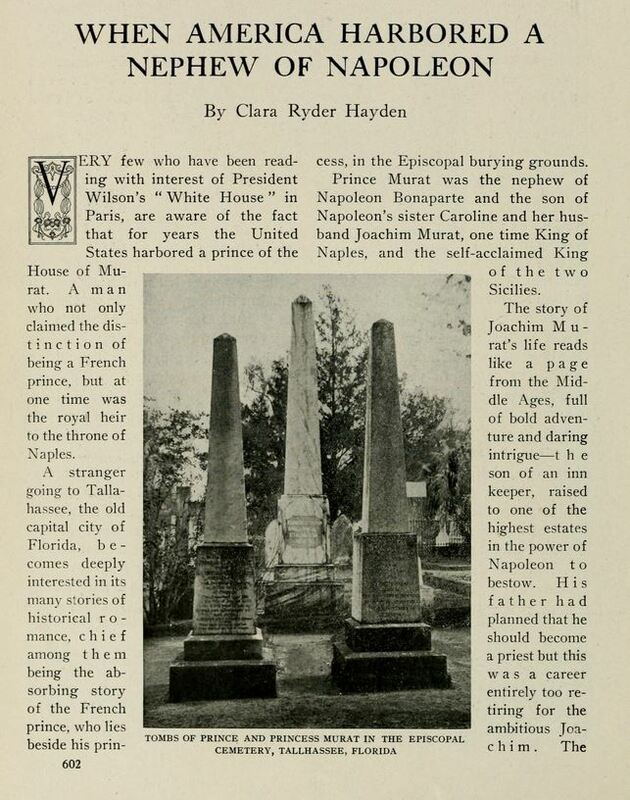 The following year, he was encouraged by the Marquis de LaFayette (yes, that LaFayette) to purchase a 900-acre parcel to the east of Tallahassee which he subsequently named ‘Lipona’ (an anagram of ‘Napoli’ — the city his father had once ruled and which he himself had expected to rule one day). 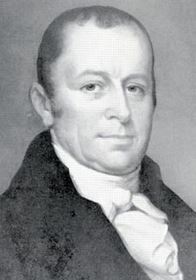 Charles served as an alderman and as mayor of Tallahassee; and then as postmaster from 1826-1838. He also served as a Colonel in Florida’s Militia. 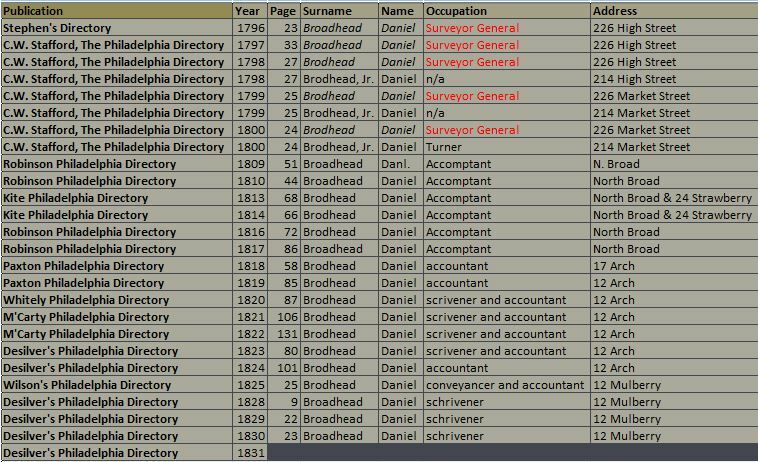 A brief description of their activities together over subsequent years can be found both here in this DAR article and in numerous publications elsewhere (some links to resources are located below). Charles actually wrote several books about his life in America and view of the country and its people, but he did not achieve any literary success. Still, if you do a search on sites like Amazon, you will find his books among your search results. Sounds like they might make a curious read! The couple spent some time back in Europe, but eventually returned to the US where they decided to try out life in New Orleans. 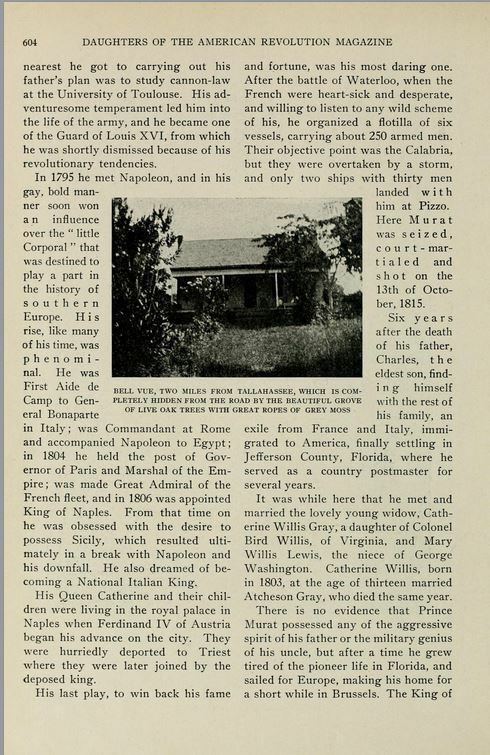 But the Tallahassee environs seem to have held some sense of ‘home’ for them, for it was to there that they ultimately returned and there, at his plantation, that Charles died in 1847 at age 46. Catherine outlived Charles by just over two decades and was able to live out her life very comfortably thanks to Napoleon III who had become very fond of her during her time in Europe. He ensured that she received both a lump sum upon Charles’ death and an annual lifelong stipend. 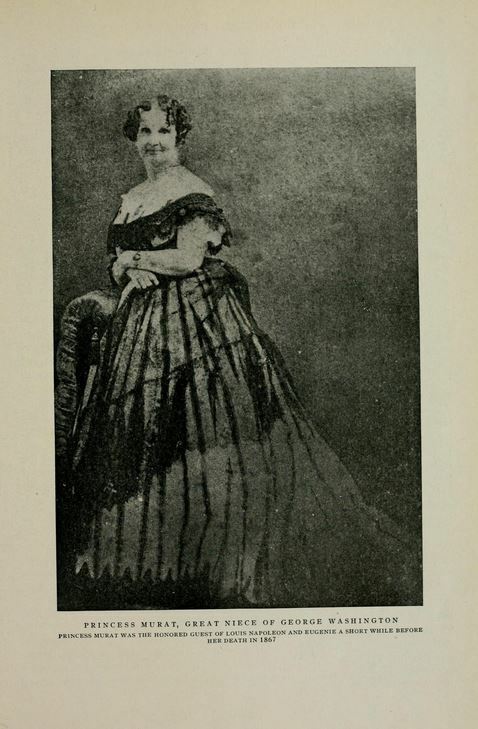 Eventually she purchased her beloved Bellevue Plantation outside Tallahassee. 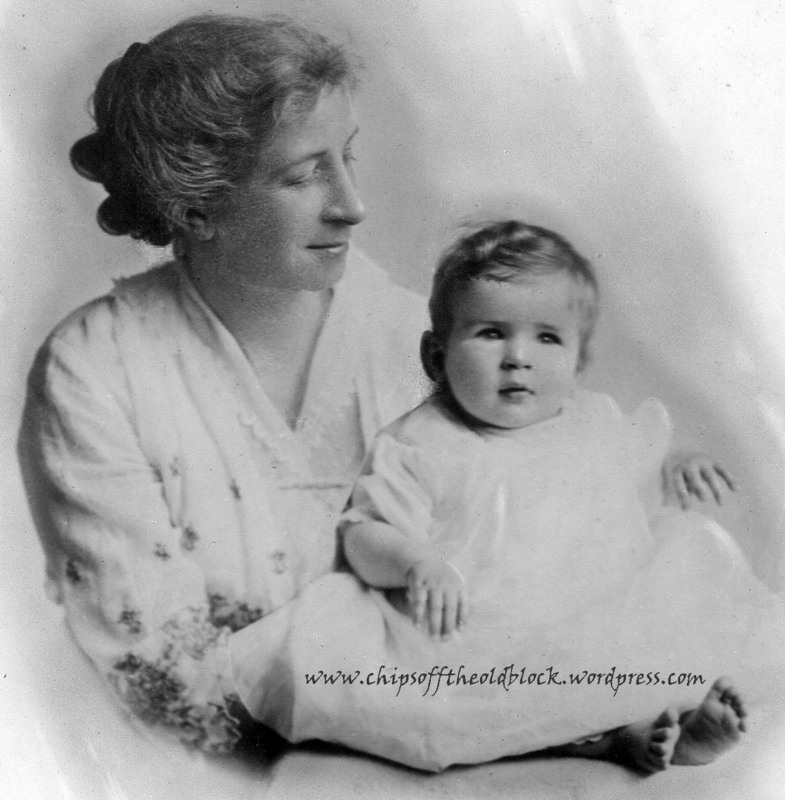 She never remarried, but took on worthy causes such as the preservation of Mount Vernon. Though she freed her slaves after the Civil War, all chose to remain with her ’til her death. The devotion was mutual—she refused an invitation to return to Europe to live, saying she could not leave them behind. A sincere and devoted friend. None named her but to praise. The DAR article follows. Enjoy! And have a good weekend. 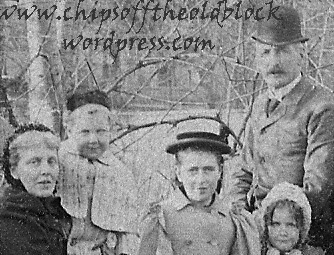 Looking forward to getting back to some family history in my next post. See you then! Note: The surname is pronounced “Jay-quiss”; there is no “c”. 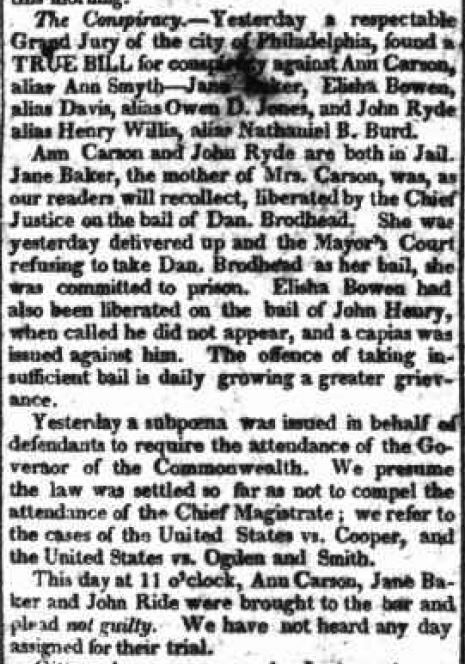 On August 25, 1880, the Elizabeth Daily Journal (Elizabeth, NJ) carried a wonderful memorial article about one of my 3rd great grandfathers: Isaac Jaques. He had passed away the day before at the age of 89 and until then had been one of Elizabeth’s oldest and most revered residents. As a shock of corn fully ripe, this venerable man, our oldest citizen, has at last been gathered to his fathers, full of years, and in the fullness of Christian faith and hope. Mr. Jaques was born August 8th, 1791, and as he died on the 24th of this month, he had therefore attained the ripe old age of eighty-nine years and sixteen days, Of this long period, about one-half was passed in the city of New York, where he began to live in boyhood , and where he learned the trade and business of his life, which was that of a merchant tailor and clothier. Some forty-three years ago, before the era of Elizabeth’s modern growth had begun, and when it had its old name and stereotyped surroundings of “Elizabethtown”, Mr. Jaques removed hither from New York and purchased the ancient Ricketts property, or a portion of it, with other tracts in the neighborhood of the present “Cross Roads”, where he soon built the house in which he died and in which he lived nearly the whole time of his residence in this place. 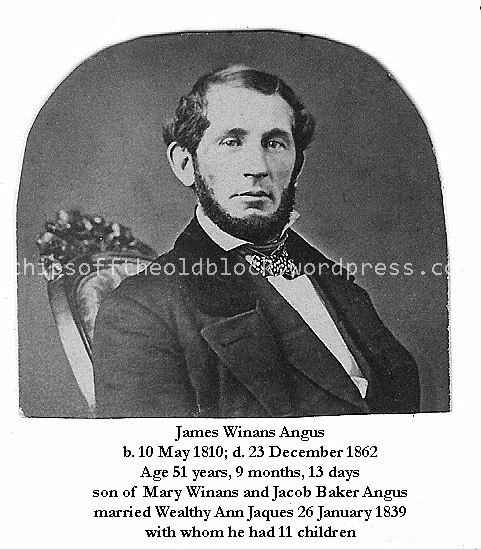 At that era, there were but few scattering houses between the “old Barber mansion”, which he subsequently purchased, now and long the residence of his daughter, Mrs. Angus [Wealthy Ann Jaques — widow of James Winans Angus], and the Port. But forest trees were numerous, and the road was a rough one indeed, with no sidewalks or attractions for the traveler, either on foot or in a carriage. But the advent of Mr. Jaques in that neglected quarter was the signal of a change for the better, which he inaugurated in person by laying a plank walk for a considerable distance in front of his premises. Time and space do not permit us here to mention other acts manifesting the public spirit and good taste of our aged departed friend at theat initial epoch of this city’s growth, even were we sufficiently familiar with his then history. The story of his early life and the record of his useful and exemplary Christian career, now claim attention and have points of more interest. And as Mr. Jaques was not only very old and a very worthy man, but also a man of rare good sense, extensive experiences of life, large acquaintance with men, great powers of observation and rich reminiscences of the past when among his friends, we may, with much propriety, extend this notice to more length than would otherwise be fitting. The writer would also premise that having been favored with some knowledge of Mr. Jacques in early life, where for a few months residing in a friend’s family who knew him and who lived near his store, then between William and Gold on John Street, he feels a special interest in his memory, and desire to do justice to it in the following imperfect sketch. 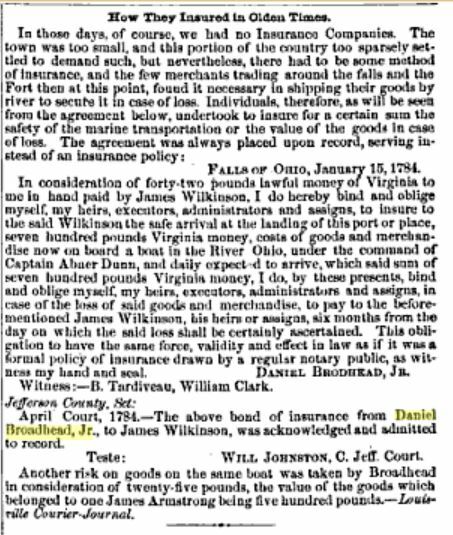 That was in 1826, and we did not enjoy an opportunity of a personal acquaintance until about the year 1870, when beginning our later connection with this city. For the last ten years this has been maintained, during which time we have frequently met with Mr. Jacques in his pleasant family circle, and, occasionally, in the old city, his former home. 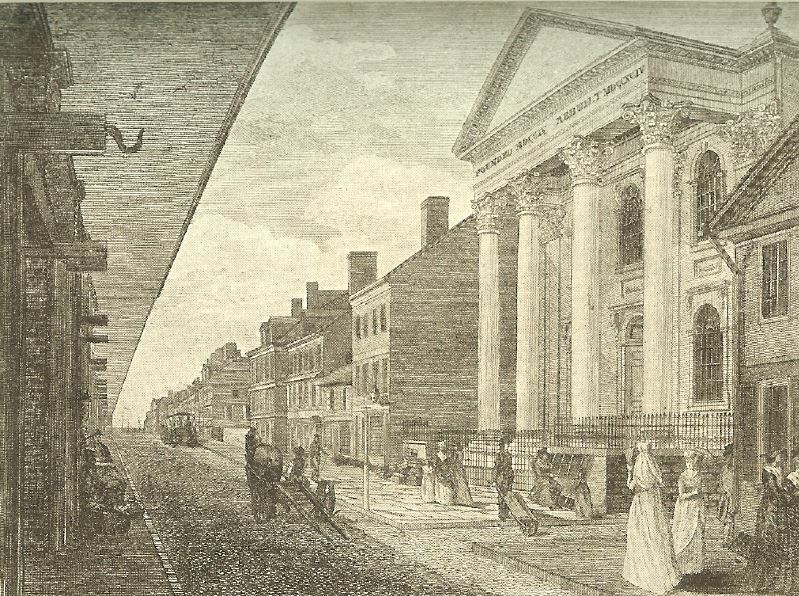 From his familiar New York, he was never weaned going over daily as along as strength would permit, and particularly drawn thither for many years past, by the honored Fulton Street prayer meeting, where his heart seemed greatly at home, and the consecrated noon hours of which he evidently enjoyed as little entepasts of heaven. Thither he would often direct his trembling steps and age-bent form, when more prudence or less zeal for the Master’s service would have kept him within his own doors. For several years past he has been notably the most aged attendant there, and it would also have been a rare thing to meet an older man walking along alone in the busy streets of New York. But the old gentlemen, though fragile in figure and tottering under the burden of nearly four-score and ten, never seemed to distrust either hinself or the protecting care that guided and guarded him through the friendly eyes and hand of others, acquaintances or strangers. 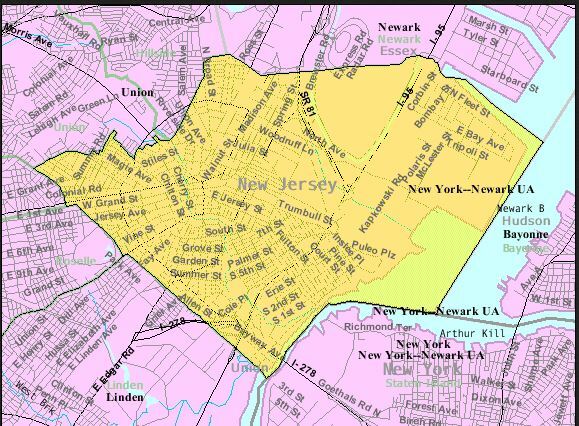 Mr. Jacques was a Jerseyman by birth – his native place being our near neighbor-town of Woodbridge, when his father lived at Inbery’s Point, near Woodbridge Creek, two miles this side of Perth Amboy. 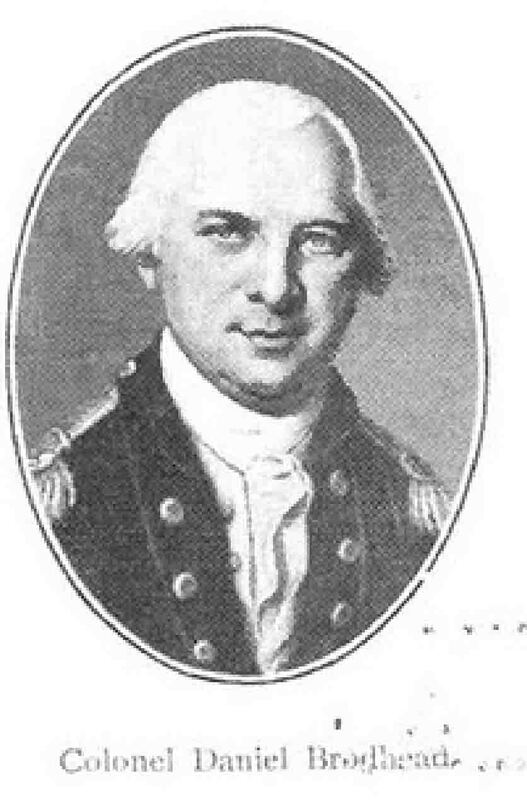 His father was Samuel B. Jacques, who commanded a Rahway company in the Revolution. He was brother of Col. Moses Jacques, a distinguished officer. The family was of French Huguenot origin. 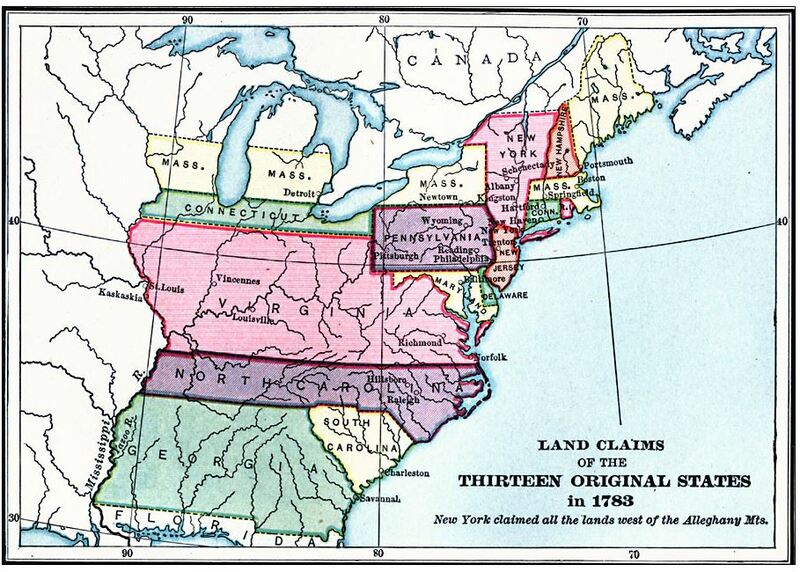 Several brothers came over, one of whom settled on Long Island, one in Connecticut and two in New Jersey. His grandfather was lost at sea on his way to America. 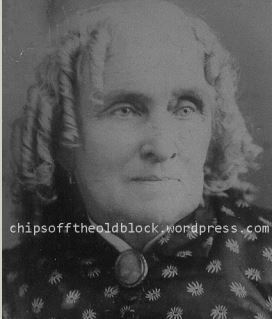 The mother of Isaac Jacques was Mary Coddington, a daughter of Jotham Coddington, of Woodbridge. 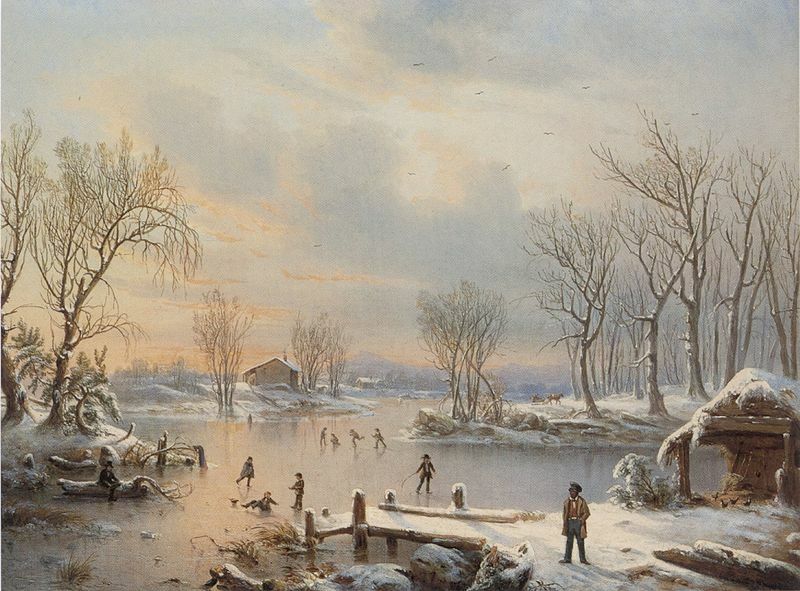 His father died about the year 1798, at Gravel Hill, near Rahway, called Milton. He was in the brick-making business, and built one of the first erected large brick houses on Whitehall Street, New York. 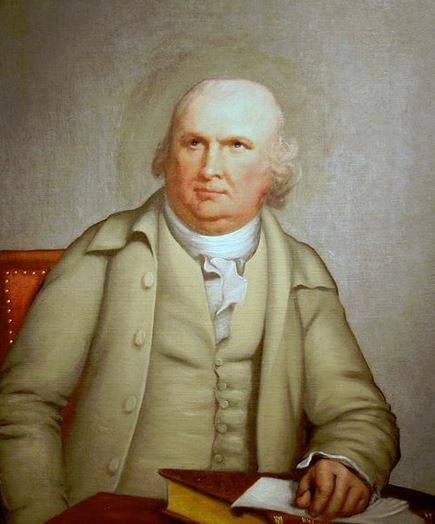 His father’s partner in brick-making was James Patton, Aid-de-camp of Governor Livingston during the Revolution. He had a ball pass through his head from ear to ear and yet survived. His father’s brother, Col. Moses Jacques, was also in business with him. The old Jacques homestead and house at Locust Grove, in Woodbridge, is now the property and residence of Mrs. Doketty, a niece of Mrs. Jacques. It is about two miles back of Rahway. There were two farms, one called “the wild cat farm”. Both are in her hands. 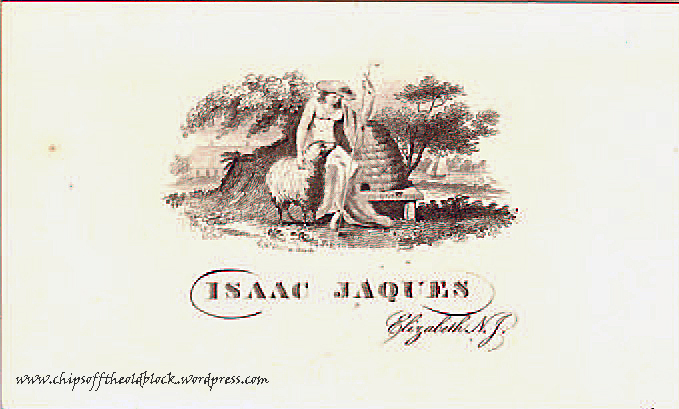 When Isaac Jacques was a little boy, perhaps seven years old, about the time of his father’s death, he went to live with his grandfather Coddington, near “Hartshorns”, a Quaker, and he had an impression that he then saw Washington as he passed through Woodbridge in a stage. If so, it must have been only a year or two before the death of that great man. Is there any account of his having been on north as late in his life as that? 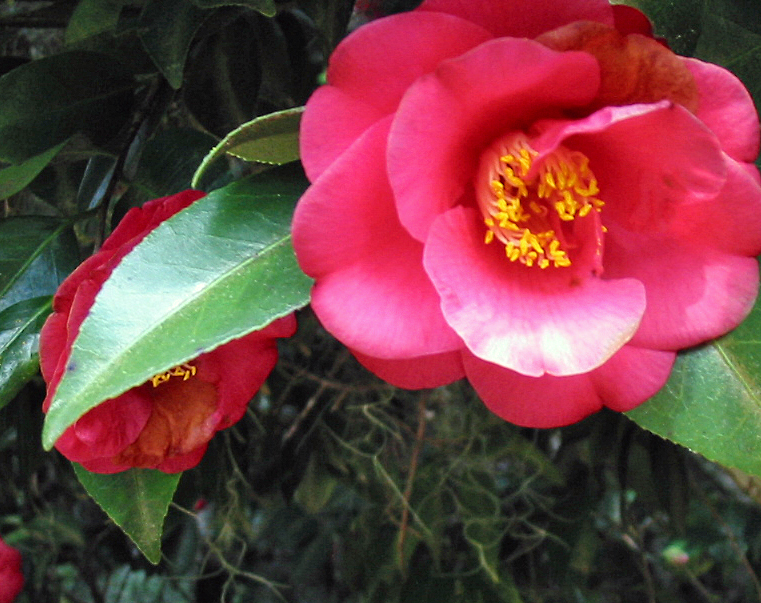 There were four physicians of the Jacques family. Doctors Moses and John died in New York. We were told by our old friend that he learned his trade of Thompson & Logan in New York. Thompson was an Irishman who married a niece of Robert Lenox, the famous old New York Scotch merchant. A sister of his, Mrs. Tait, died at Lyons Farms a few years ago. 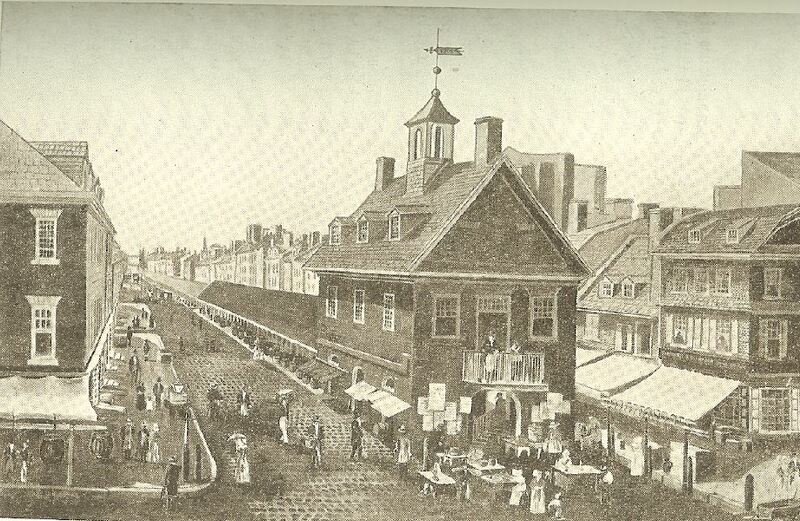 His first store in New York was in John Street, near William, and he built a store right opposite. 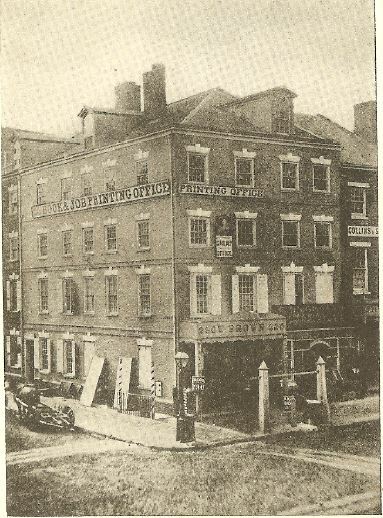 Over his store was a public room where he used to hear Thomas Addis Emmett speak three hours at a time, as also Thornton, and many other eminent orators. Mr. Jacques’ recollections of former citizens of New York were extensive and very interesting. His memory and well-preserved mental faculties generally was remarkable. As to his religious record, he believed that he experienced conversion in early life under the preaching of his father’s pastor, the Rev. 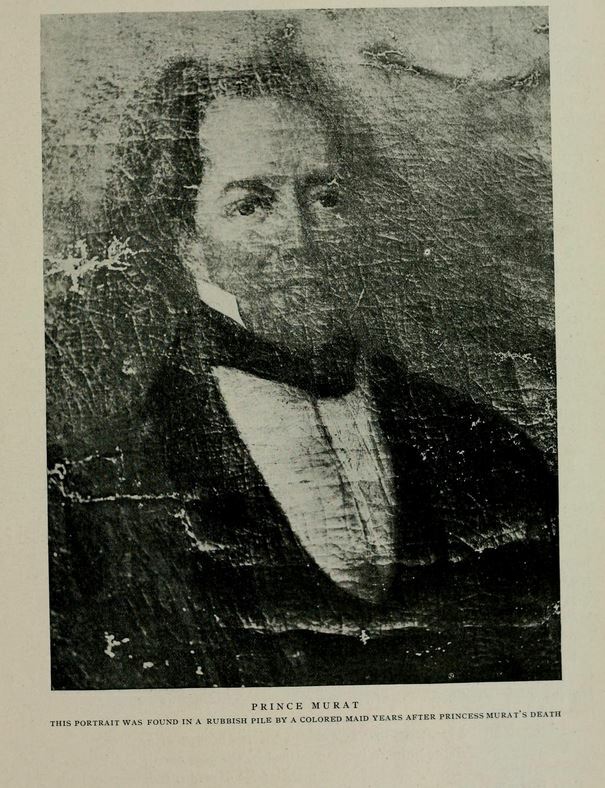 Dr. Roe, of the Woodbridge Presbyterian Church, but with confirmed impressions by a sermon of Dr. McDowell in the city of New York. There he regularly attended, and there he heard the late distinguished Dr. Spring, so many years the pastor of the “Brick” church, preach his “trial” sermon. He was an early Sabbath-school teacher, and once in the lecture-room in Rose Street, when he had eleven boys in his class, four of whom became clergymen – the late Rev. Dr. Murray of this city, being one of them. He was converted in the old John Street Methodist Church. Mr. Jacques enjoyed the esteem and confidence of the good citizens of New York. Thus when quite a young man he was invited to take charge of the New York Hospital. It was then located in a large stone building at the upper end of Pearl Street, in Broadway. This position, however, he declined.